Customize your easy pop up tent kit with a custom printed tent flag attachment! 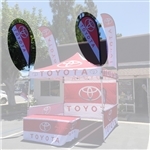 Approximately 8’ tall or 12' tall, these custom printed tent flag attachments will help you be seen at any event. Great for trade-shows, festivals, concerts and car shows. Tent frame flag kits are either 8’ tall or 12' tall and include our heavy duty steel tent frame flag base, strong sectioned fiberglass pole and a quality water-based digitally dye printed feather flag. When mounted on the tent frame, the tip of the flag is approximately 13’ tall or 17' tall. This will make your event display noticeable above your competitor’s tents at your event. All tent flags are available as single or double-sided print. Our superior methods of printing means every one of our tent flags are manufactured to the highest standard. Each advertising tent flag is water-base digitally dye printed in full color, resulting in excellent color matching and deep, rich color contrasts. Our advertising flags come in various shapes: Feather, Teardrop and Banner. These tent flags are commonly used to advertise a marketing message, brand your product or company, promote an event or display the support of a fundraising sponsor. Customize your own tent flag and submit the tent flag as design ready on our provided tent flag template or utilize our designer’s brain and ask for some help with your tent flag design and template for just a little bit more money. The reason I know you will love our tent flags more than any of our competitors is because we don’t overlook any details. What do I mean? Well check this out… On our competitor’s flags, the seam usually stops short at the top of the tent flag so the pole doesn’t extend to the tip of the flag. Not our flags… Our pole pockets extend to the tip giving your flag a cleaner and sharper look at the top. That’s not all folks check this out… our competitors like to sell this cheap aluminum tent poles…I don’t know if you know, but if you live in a windy city you might as well just pull your cash out and let it fly away in the wind if you buy one of those tent poles. Aluminum tent poles will bend in the wind and the sucky thing is, once they bend that’s it game over might as well buy another because bend it back and it will break. Never fear folks Banner and Flag Wholesalers are here for you! We have a fiberglass pole that won’t bend in the wind and that will last much longer than any ordinary aluminum tent flag pole! If that wasn’t enough to ensure that we are better I have one final statement that I know will for sure seal the deal… ready… “Ball bearing spindle on all of our tent flag bases”. Yup you read that right ball bearing spindle!!! You might be asking yourself why would that seal my deal with this company?! When you are at an event ever notice the tent flags that get all bunched up at the bottom and you miss half the message because the tent flag is tangled? Well that’s where our ball bearing spindle beats out our competitors, because our tent flags are free to move in the wind in any direction the wind flows. The spindle will allow the tent flag the freedom to change directions and you won’t ever lose out on any customer’s walking by your easy pop up tent with tent flags because your message won’t be hidden and bunched up! Now that you have found product with such great quality and pricing why would you wait on sealing the deal for your own custom printed tent flag? Don’t delay, purchase your tent flag and be seen by those who matter today! For more information please email us at info@bannerandflagwholesalers.com or call us at 888-675-9610.